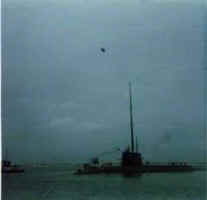 By the 1970's, the Kamehameha and the rest of the "41 for Freedom" had become the mainstay of the United States' strategic nuclear arsenal. 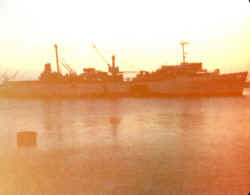 The Kam began the decade with a transit from the Pacific to the Atlantic via the Panama Canal. 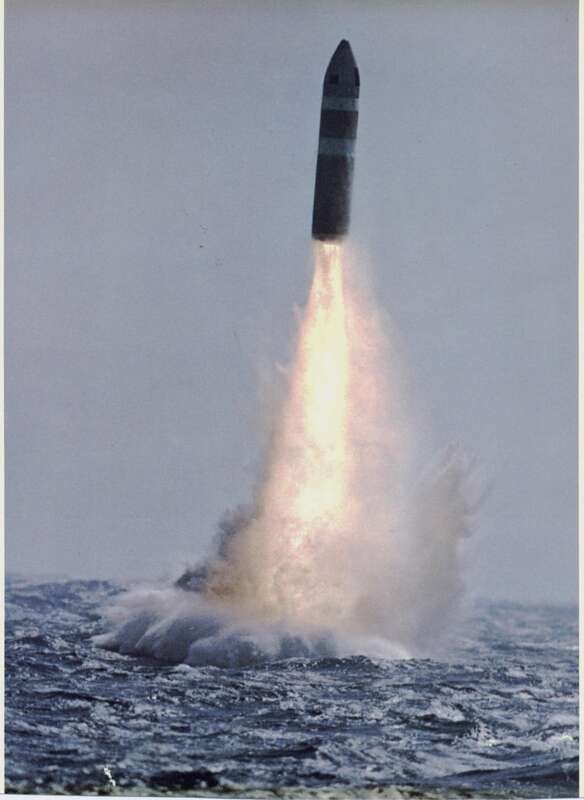 In '71 and '72, the Kam went into a refueling overhaul during which the original Polaris A3 weapon system was upgraded to the new Poseidon C3 missile. 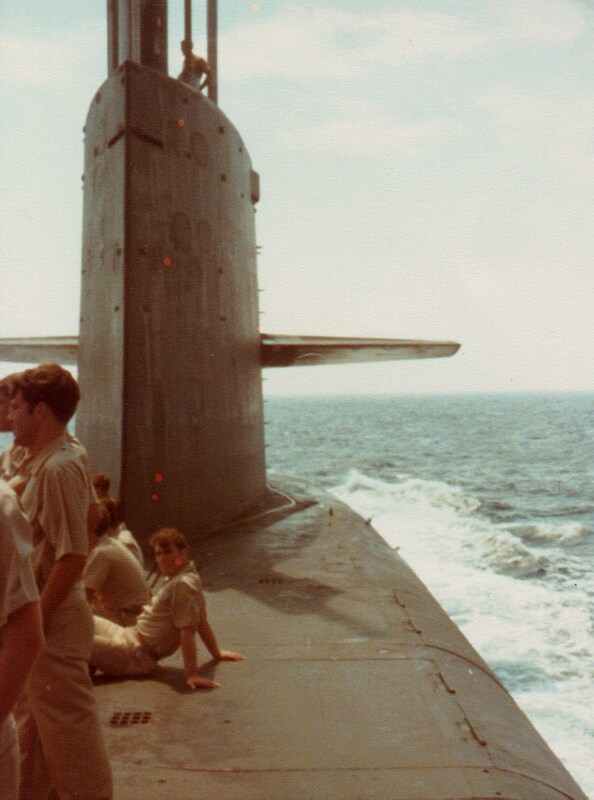 For the crew of the Kamehameha, most of the 1970's was mostly business as usual, the never-ending business of maintaining readiness and long deterrent patrols. 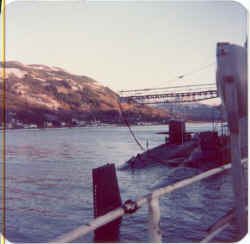 In the 1970's, the Kam made patrols out of Rota, Spain and later, Holy Loch Scotland. 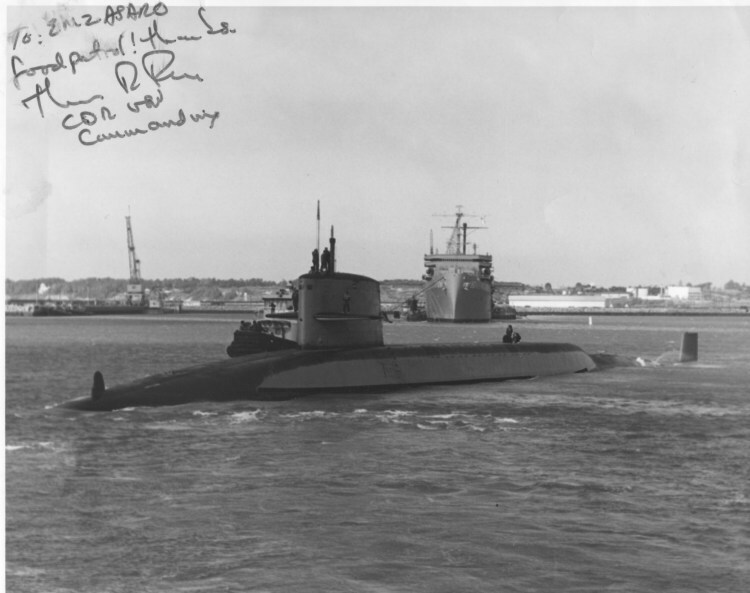 In July 1979, the Kam joined Squadron 18 and made patrols out of Charleston, South Carolina. After completing 15 deterrent patrols out of Guam, the Kamehameha returned to Hawaii for a brief visit on her way back to the shipyard for her first major overhaul. This article from May of 1970 was saved by Tom Hanson. 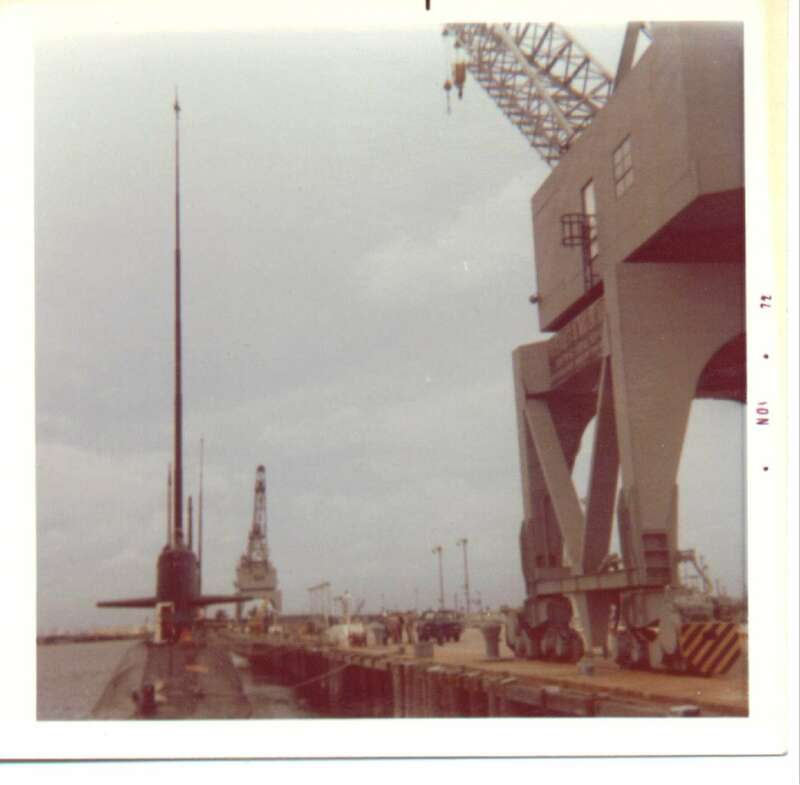 During the shipyard in 1971 and 1972, the Kam was converted from the Polaris A3 missile to the new and improved Poseidon missile. 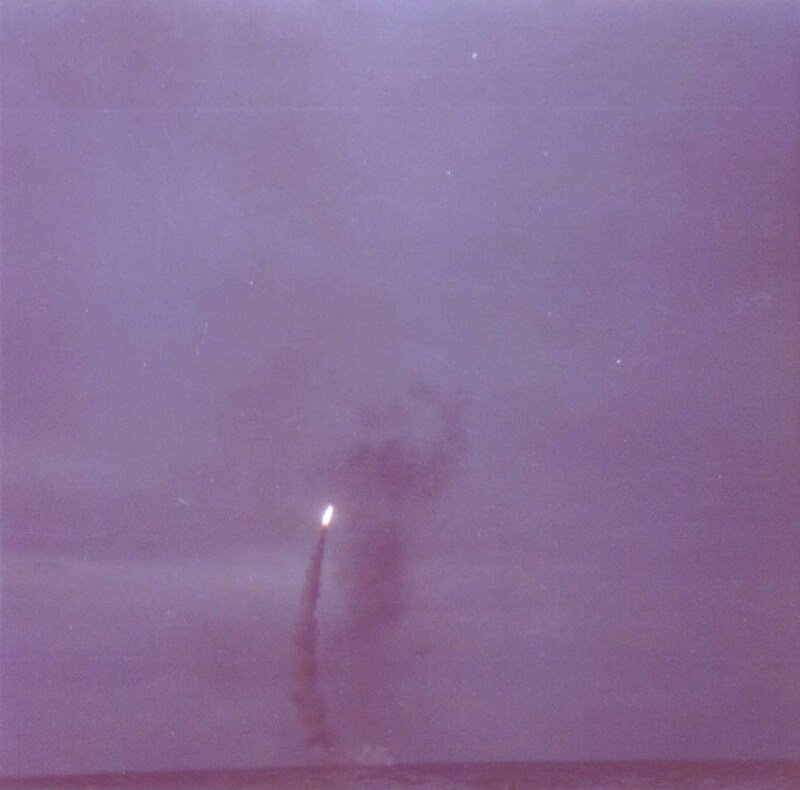 This series of photos was provided by Bob Martin showing the Kam's first launching of the Poseidon missile on December 15, 1972. These photos were taken at Port Canaveral. Bob says: "You will notice that the Kam has been fitted with a temporary antenna just for this launch... 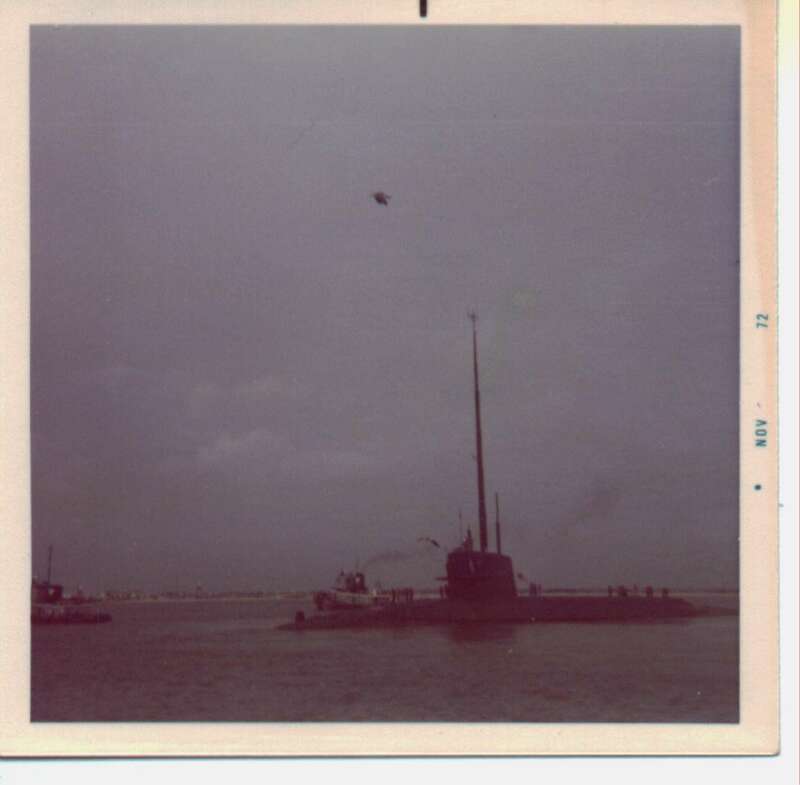 The antenna was 150 feet in length complete with aircraft warning lights,,, it was designed to stick out of the water when the Kam was at missile launching depth." 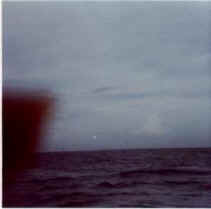 Look closely just to the right of the thumb, and you will see the top of the 150 foot antenna. 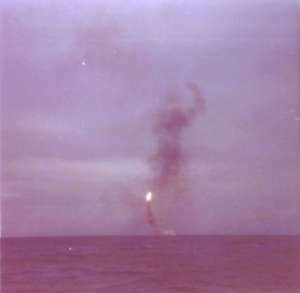 Also from Bob Martin, This is a launch of a Poseidon missile. Not from the Kam, but a promotional photo. 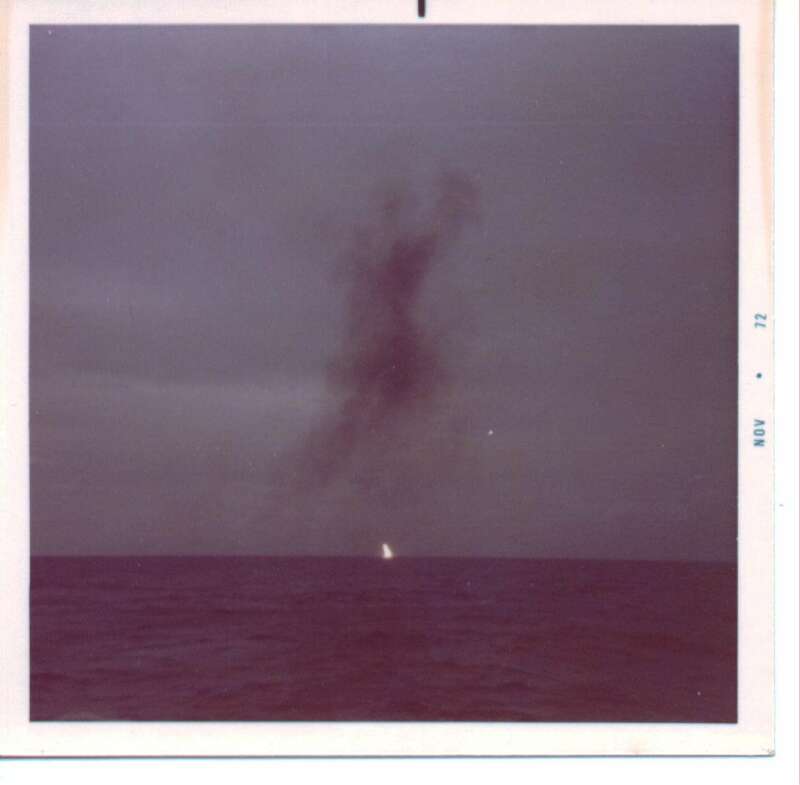 This was "punched out by a Torpedoman 1st class named Larry "Moose" Mosiman. 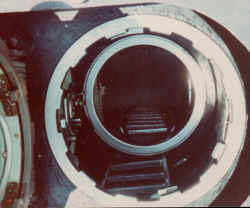 It hung on the missile tube next to the launcher panel." 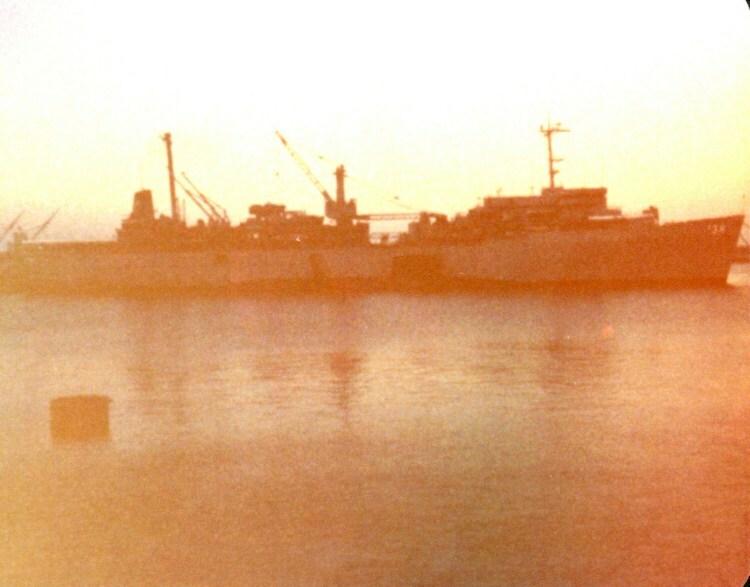 The photo is from Rota Spain in the 1970's. Photo donated by Steven J. Asaro. 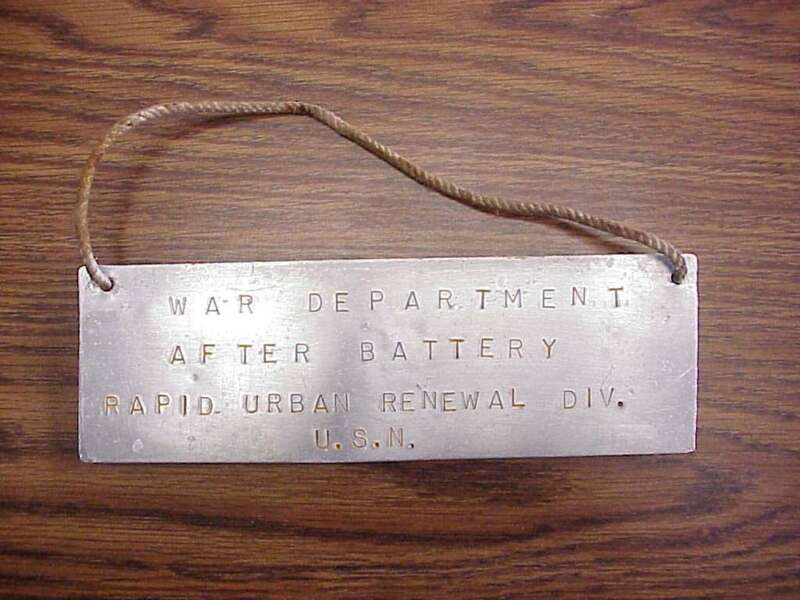 Note that it is signed by Capt Thomas R. Fox. I like the two-toned paint scheme. When I was on the Kam is the 80's she was all black. 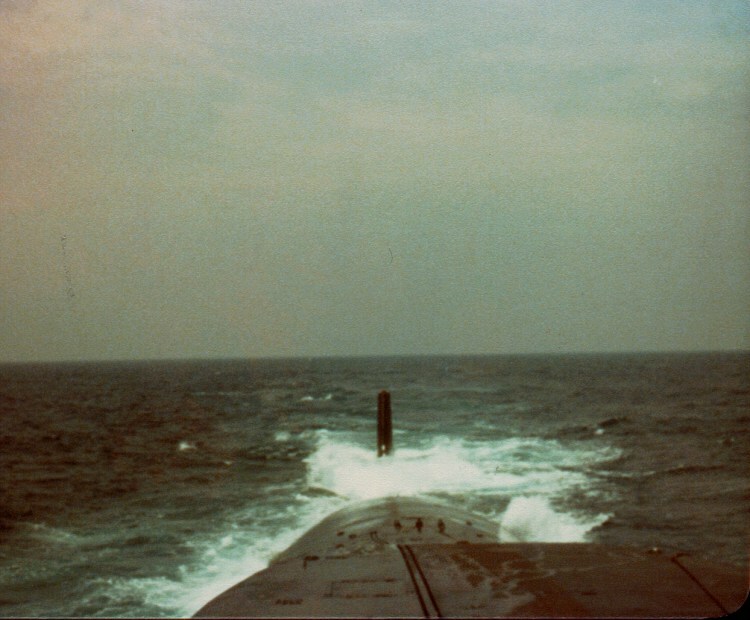 From Richard Sprowl: "I think this is the Sub Tender Canopus in Rota, Spain. This would be about June or July of 1978. 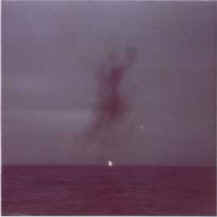 You can faintly see the outline of the Kamehameha in front of it." 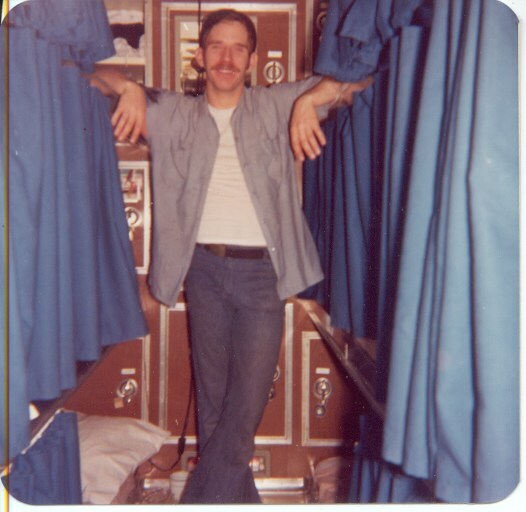 From Richard Sprowl: "This is me on deck about 400 miles off the coast of New Jersey, Aug, 1978. 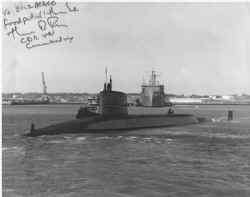 We left Rota and went to Groton to pick-up some mid-shipmen and dependents for a couple of skippy cruises." 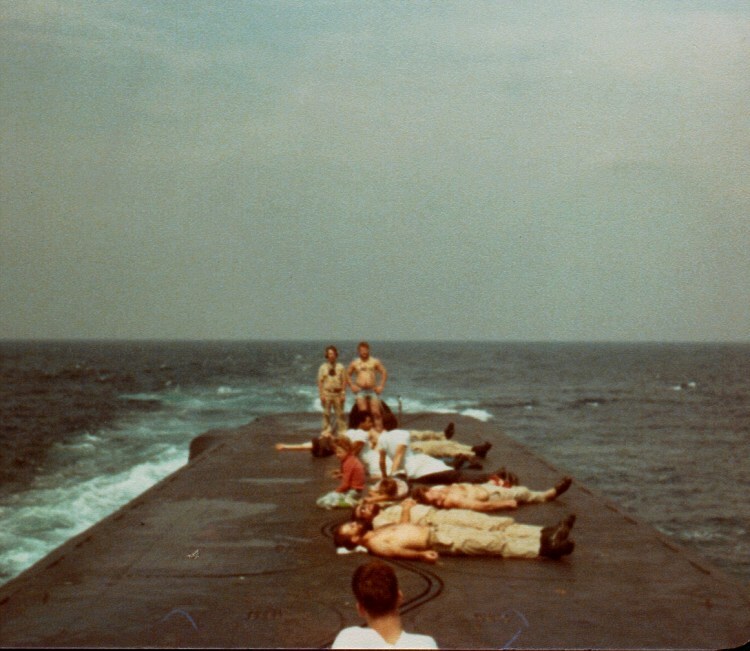 From Richard Sprowl: "Some crew and dependents getting a tan about 400 miles off the coast of New Jersey, Aug, 1978. Very efficient, the missiles tan your back while the sun gets your belly. I do not recognize anyone in this picture, any help would be appreciated." Aft deck about 400 miles off the coast of New Jersey, Aug, 1978. 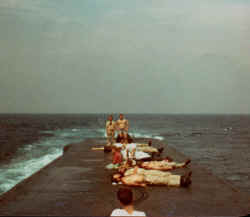 Also from from Richard Sprowl: "Mid-shipmen on deck about 400 miles off the coast of New Jersey, Aug, 1978. This was the last skippy cruise. After this we headed down to Andros Island, Bahamas for some torpedo testing in the Tongue of the Ocean. Since I went on both skippy cruises, I was able to get off on Andros for 3 days. 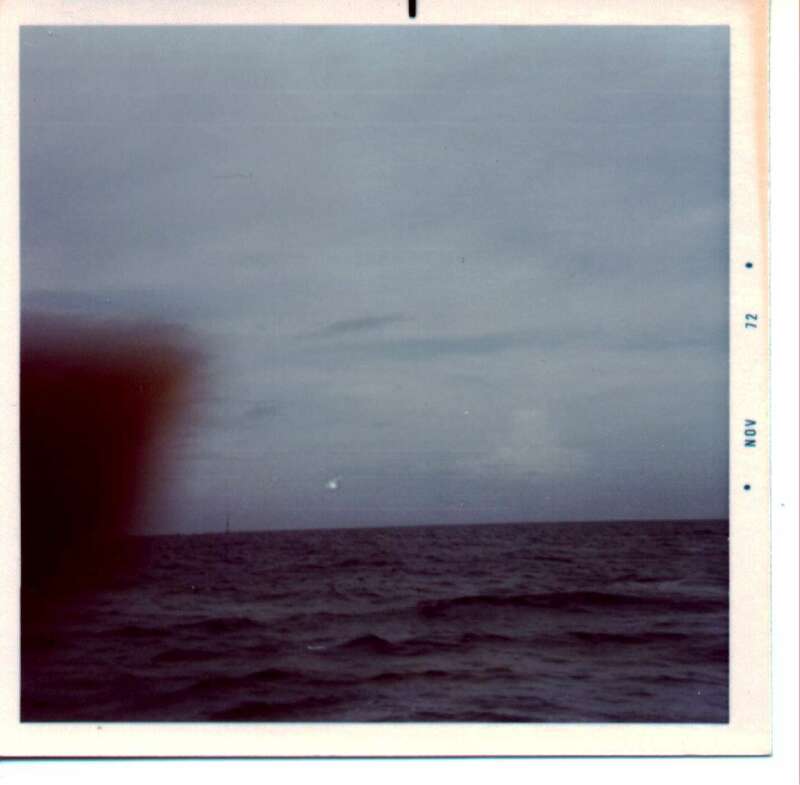 Nothing there but the beach, beer, and the RCA facility. It was a good time. See more of Richard's photos in Kam crew photos. "I took this in Holy Loch during crew change, I believe we had a break in the weather that day. The two patrols I made there we both in the winter. The Kam is outboard. 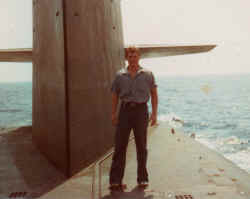 This was in late 1978. The sun shining on the hill is nice. 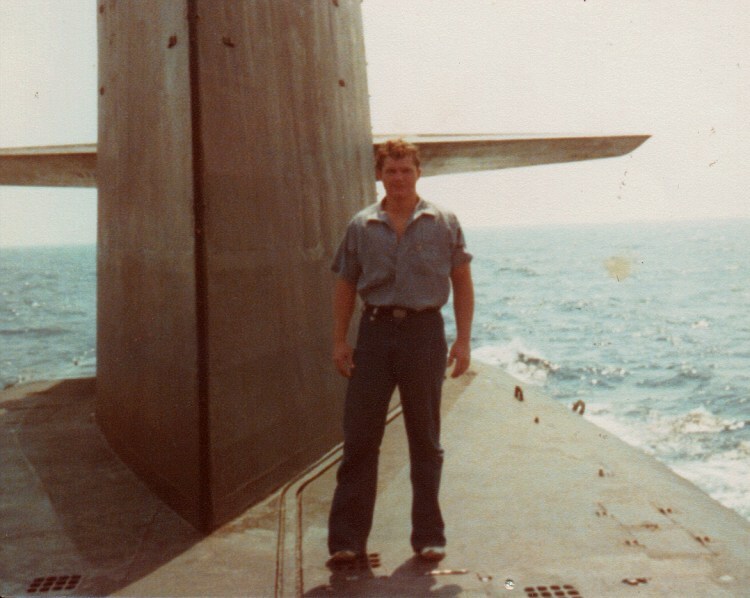 I do not remember which boomer is inboard." 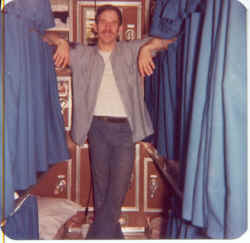 This is a photo of RM2(SS) Richard Hirsch taken in crew's berthing. Donated by Steve Chickering. Click here to see more crew photos. Wanted: More photos and stories from the 1970s. Also, more date, and places, which patrols were done and when?